This Sunday we Catholics, along with several other Christian denominations, will celebrate the Feast of Christ the King. This is a relatively new liturgical celebration given that it was established by Pope Pius XI in 1925 in an era of increasing nationalism and secularism. (Sound familiar?) The message that the pope wanted to deliver was one of saying that there is a Power beyond that of the secular rulers, one to whom they are accountable, that their power was not the ultimate power. This message was vitally important in a world that was witnessing the rise of both communism and fascism, both of them totalitarian extremes that saw no need for God. In our own times, with slight nuances of meaning the same message is both timely and important. Our own society is becoming increasingly secularized, though the threat is nowhere near as great as it was in Europe in the nineteenth and early twentieth centuries. Nonetheless in both the political realm and in our culture there is a powerful tendency on the part of many to want to push religion to the side. I would suggest, however, that there is another dimension of this wonderful feast that is important for today. That dimension is made clear when we ask, "What kind of King is Jesus Christ?" Christ's Kingship is nothing like that of any earthly king, nor is it like that of any earthly leader. His is a kingship of humility and service, a kingship expressed in His own words, "The Son of Man did not come to be served but to serve and to give his life as a ransom for the many." (Mt. 20:28) These words were spoken after reprimanding his own apostles for quibbling over who would be the first in His Kingdom. At a time where we see the abuse of power not only in politics, but in the Church herself, in business with things like the Madoff scandal and in society with stories of bullying being told everyday, be it in schools or sports locker rooms, the Kingship of Christ teaches us that true authority and power is exercised not be controlling others and putting them down, but by lifting them up and bringing the best out of them. I believe that Pope Francis is modelling this kind of leadership and authority. I also believe that there are many in politics, in business, in sports as well as in families who exercise this kind of leadership. This kind of authority, like Christ our King, is willing to die for those that they lead. They have that willingness because they they are motivated by love of God and love of those that they serve. The Gospel text for today (Luke 19:1-10) is one of my favorites. 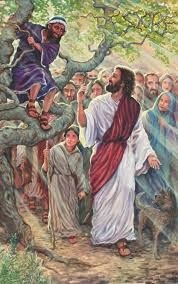 A man named Zacchaeus, a wealthy man, short in stature and a tax collector has climbed a tree so that he could see Jesus. Jesus invites him down and then invites himself to dinner at the home of this man, an action that shocked the crowd because this Zacchaeus was known to be a sinner. An explanation is in order here. For us moderns, as much as we dislike taxes, it is possible to make an honest living working for the IRS or any state or city tax collecting agency. This was not so at the time of Jesus. Tax collectors (or publicans) were Jews who worked for the occupying Roman government. They were responsible for collecting and sending to Rome any number of taxes on income, farm goods, road tolls, etc. Most of them gouged and defrauded people, collecting more than Rome needed, and keeping the rest for themselves. They were, understandably, a despised lot. One can imagine that in spite of having accumulated a great deal of wealth our man Zacchaeus was probably filled with a great deal of guilt and self-loathing. He know, too, that he is despised by his own people. He has hope in his heart that Jesus can set him free from this, which is exactly what happens. Jesus comes into his home and he becomes a changed man, giving half of his possessions to the poor and returning fourfold all the money he has extorted. What does this story tell us? If you are like me and Jesus invited himself into your home (which, by the way, he often does) you would probably like to tell Jesus all the wonderful things that you have done. After all I have preached over 400 parish missions, written a book, have served in some very poor parishes, etc., etc. But I also know deep within me that I have faults and failings, sins and weaknesses. This is the part of me that needs Jesus' mercy. Quite often those of us that are practicing Catholics, or practitioners of any faith, are tempted to think that our good deeds and practices are what will save us. Those who have strayed seriously from the path have little or any great deeds to present to the Lord. What they often do have, like our tax collector, is a repentant heart that begs for the mercy and grace, that admits their need for Jesus, for mercy, for salvation. Interestingly enough Jesus never offers anything but mercy to thieves, prostitutes and tax collectors. Only the self-righteous incur his wrath. We all need to pray with the psalmist (Ps 50, 19), "A broken and contrite heart you will not spurn." This does not mean that our good deeds don't matter, but rather that we do good deeds because we are grateful for Jesus love and mercy, not to obtain it.